Mike Jackson | A balanced diet . . . Earlier today, I was lying in bed sipping a mug of tea and listening to the news on BBC Radio 4. And wondering what progress (or lack thereof) there had been regarding negotiations between the Tories and Labour to resolve the Brexit impasse that has bedeviled politics in this country for far too long. I couldn’t help speculating that this whole Brexit debacle will be the one and only thing that Prime Minister Theresa May will be remembered for. Political legacies are the basis of history. So whenever some historian or other comes to analyze her legacy, the Brexit negotiations will be at the top of any list, whether they actually lead to Brexit or not. We’ll find out over the next week. Maybe. Then, that got me thinking about earlier Prime Ministers and what they are remembered for. Not necessarily their full legacies. And Presidents of the United States as well. One of the reasons for this is that I can think of no point in my lifetime (I was born in November 1948) when there were two more inept occupants of No 10 Downing Street and the White House. While I can recall Presidents of other countries, of France, of Peru, Costa Rica, or the Philippines where I lived for many years, or countries like South Africa that had leaders who performed on the world stage, like Nelson Mandela for example, or his predecessor, FW de Klerk, the last apartheid head of state, even German Chancellors, I’m much more familiar with US politics and political figures. Why my interest in US politics? That began in January 1973, when I moved to Peru, and my weekly news roundup came courtesy of Time and Newsweek. It was, after all, also the time of Watergate. And I’ve followed US politics closely ever since. However, let’s start with Prime Ministers. L-R: Clement Attlee (Labour), Jul 1945-Oct 1951; Sir Winston Churchill (Conservative), Oct 1951-Apr 1955; Sir Anthony Eden (Conservative), Apr 1955-Jan 1957. L-R: Harold Macmillan (Conservative), Jan 1957-Oct 1963; Sir Alec Douglas-Home, Oct 1963-Oct 1964; Harold Wilson (Labour), Oct 1964-Jun 1970. L-R: Edward Heath (Conservative), June 1970-Mar 1974; Harold Wilson (Labour), Mar 1974-Apr 1976; James Callaghan (Labour), Apr 1976-May 1979. L-R: Margaret Thatcher (Conservative), May 1979-Nov 1990; John Major (Conservative), Nov 1990-May 1997; Tony Blair (Labour), May 1997-Jun 2007. L-R: Gordon Brown (Labour), Jun 2007-May 2010; David Cameron (Conservative, in coalition with Lib Dems), May 2010-Jul 2016; Theresa May (Conservative), Jul 2016-present. So what are these fourteen individuals remembered for, good or bad? My first recollections of politics in the UK came with the administration of Sir Anthony Eden. His time in office must surely be remembered for the Suez Crisis (or second Arab-Israeli War) of late 1956, when UK and French forces waded in on the side of Israel to seize control of the Suez Canal. What I particularly remember was rationing of petrol (gasoline), and using coupons to purchase fuel for the car. The UK’s subsequent humiliation led to Eden’s resignation shortly afterwards. In 1945, the Labour Party led by Clement Attlee surprisingly won a General Election, defeating the Conservatives led by Sir Winston Churchill, the successful war-time Prime Minister. Undoubtedly, Clement’s legacy is the foundation of the National Health Service (NHS), in July 1947. I was approximately the 190,063rd baby born under the NHS! Churchill had his political revenge in 1951. While his second administration oversaw the end of hostilities of the Korean War, and an armistice, there was a deepening of the Cold War that had commenced immediately after the end of Second World War. Churchill had coined the phrase ‘Iron Curtain’ in 1946. On Eden’s resignation, Harold Macmillan became leader of the Conservatives and Prime Minister, and headed an administration that saw the first sustained economic revival since the war. Macmillan is famous for two sayings. The first, Most of our people have never had it so good (from a speech in 1957) relates to the growing economic prosperity. The second, I was determined that no British government should be brought down by the action of two tarts, concerns the 1963 political scandal, the Profumo Affair, that irreparably damaged Macmillan’s government. Macmillan resigned in October that year. Sir Alec Douglas-Home became Prime Minister on Macmillan’s retirement (having renounced his peerage, as the 14th Earl of Home), and headed a Conservative administration for just one year, being defeated in the October 1964 General Election by the Labour Party led by Harold Wilson. Douglas-Home is perhaps best remembered for his stint (1960-1963) as Foreign Secretary rather than his premiership. Wilson won the 1964 election with a majority of just four MPs. In 1967, his government was forced to devalue the currency, the GB pound (£), and Wilson is remembered (and criticized) for his pound in your pocket speech in which he assured listeners that the pound had not lost its value. In 1965, during Wilson’s first administration, the political decision was made (on cost grounds) to cancel the TSR-2 strike and reconnaissance aircraft, considered one of the most sophisticated planes to have been designed in the UK. As one aeronautical engineer said at the time, All modern aircraft have four dimensions: span, length, height and politics. TSR-2 simply got the first three right. The first Wilson administration saw the outbreak of The Troubles in Northern Ireland, which intensified and continued right up to the administration of Tony Blair in 1998 and the signing of the Good Friday Agreement. The Labour Party was defeated in the June 1970 General Election (the first election I ever voted in) by the Conservatives under Edward Heath. Heath’s administration lasted just under four years. But his significant contribution was to lead the country into membership of the European Economic Community (EEC) in January 1973 (just as I was leaving to work in Peru). Forty-six years later the nation is divided over its continued membership of the European Union (successor to the EEC and European Community, EC). Harold Wilson returned to power in the 1974 General Election. Continued membership of the EC was at the forefront of UK politics. In an unprecedented move in the nation’s political history, a referendum was held on 5 June 1975 in which a substantial majority voted for continued membership. How times have changed! Wilson resigned in March 1976, and was replaced by his Foreign Secretary, James Callaghan. Callaghan’s government lasted just three years, buffeted by economic stresses, and his downfall followed the disastrous 1978-79 Winter of Discontent. In 1979, the nation had its first female Prime Minister, Margaret Thatcher. She had ousted Edward Heath as leader of the Conservative Party in 1975. Her premiership is remembered for three issues. First was her forceful response to the invasion of the Falklands Islands by Argentina in April-June 1982. But two issues eventually brought her down. The introduction of the Community Charge (commonly known as the Poll Tax) in 1989 was highly unpopular. Industrial relations during her premiership also deteriorated. The Miners’ Strike of 1984-85 was a major industrial action in protest at the closure of coal pits. It was prolonged, violent at times, and divided communities, many of which have hardly yet recovered the loss of jobs. By November 1990, Thatcher had been visited by senior Tory politicians and told to go. She resigned and was replaced by her Chancellor, John Major. I left the UK in July 1991 to work in the Philippines, returning in May 2010, just before a General Election in which I was not eligible to vote. Thus I have very little direct experience of the premierships of John Major, and his successors Tony Blair and Gordon Brown (both Labour leaders). John Major was Prime Minister during the first Gulf War in 1991. He helped negotiate the Maastricht Treaty that same year that led to further European integration and the formation of the European Union. After the government withdrew the pound from the European Exchange Rate Mechanism, Black Wednesday on 16 September 1992, there was a fall in confidence in Conservative economic policies, a situation from which Major hardly recovered. However, he remained in office until May 1997, and even won a General Election. Under John Major the privatization of British Railways began; the monopoly was broken up and individual franchises sold to operate the nation’s rail system. Tony Blair led Labour to a landslide victory over the Tories in the General Election of May 1997. Blair, at age 43, was the youngest Prime Minister since 1812. He went on to win two more elections in 2001 and 2005. He had very high popularity ratings for his handling of the response to the death of Diana, Princess of Wales in August 1997. Under his administration the Human Rights and the National Minimum Wage Acts were introduced, and the Good Friday Agreement finally brought peace to Northern Ireland. On the other hand, Tony Blair will probably be remembered most for his cozy foreign policy relationship with US President George W Bush and his involvement of UK forces in the invasions of Afghanistan in 2001 and Iraq in 2003. For these actions he will never be forgiven by a significant portion of the population, and it’s fair to say that his reputation has been permanently damaged despite the many good things achieved by his centrist Labour administration. Blair resigned on 27 June 2007, and Gordon Brown (then Chancellor of the Exchequer) immediately assumed the premiership. Gordon Brown was in office until May 2010 when he was defeated by David Cameron and the Conservatives. His most notable achievement was to steer the nation through all the challenges of the 2008 global recession, bailing out the banks and helping to stabilize financial systems here and around the world. David Cameron did not achieve a House of Commons majority in the May 2010 election, and was forced to seek support of the Lib Dems in a coalition government. Budget austerity was the watchword of this government, the introduction of tuition fees for university students, and other financial measures from which the nation is still suffering. This was also a consequence of the recession before Cameron came to power. One of the early pieces of legislation from the Coalition was the Fixed-term Parliaments Act 2011, that has had its consequences subsequently. Cameron also sought to negotiate revised membership terms for the UK in the European Union and, as a sop to the right wing faction in his party, he foolishly promised to hold a referendum on continued membership of the EU if the Tories were returned to power in 2015. He didn’t expect to win an outright majority, and when he did, he was in hock to anti-EU factions among his MPs. The fateful referendum was held on 23 June 2016, and although Remain was official government policy, the result was a Leave majority of 52 to 48%. A decision that we continue to rue three years on. On losing the referendum, Cameron immediately resigned leaving the contest wide open for his successor. Although originally a favorite to succeed Cameron, Brexiteer Boris Johnson withdrew before polling began among Tory MPs and constituency members, leaving former Home Secretary Theresa May as the only candidate. She became Prime Minister on 11 July 2016. And she has proven to be one of the most inept politicians I can ever remember, without empathy (viz. her response to the Grenfell Tower fire tragedy in June 2017 around the time of the general Election), a cold fish, who has led the nation down a disastrous Brexit path. She was so inept as to call an early General Election in 2017 (despite the Fixed-term Parliaments Act), losing her overall majority, and since then propped up by ten Democratic Unionist Party MPs from Northern Ireland. But due to major policy splits in her own party, she has been unable to push through her EU Withdrawal Agreement. It has been defeated three times in the past eight weeks, and unless something comes of the discussions between the Conservatives and Labour over the next week, the UK will crash out of the EU on 12 April. Theresa May will also be remembered, and in a very bad light, for her anti-immigration stance and policies she introduced when Home Secretary. Fortunately, it seems she will not be Prime Minister for much longer. But will it be a question of out of the frying pan and into the fire? Boris Johnson as her replacement? Heaven forfend! Let’s now turn to the Presidents of the Unites States, or POTUS. From Harry Truman to Donald Trump, there have been thirteen Presidents of the United States since 1948. L-R: Harry S Truman (33rd, Democrat), 1945-1953; Dwight D Eisenhower (34th, Republican), 1953-1961; John F Kennedy (35th, Democrat), 1961-1963. L-R: Lyndon B Johnson (36th, Democrat), 1963-1969; Richard M Nixon (37th, Republican) 1969-1974; Gerald Ford (38th, Republican) 1974-1977. L-R: Jimmy Carter (39th, Democrat) 1977-1981; Ronald Reagan (40th, Republican) 1981-1989; George HW Bush (41st, Republican) 1989-1993. L-R: Bill Clinton (42nd, Democrat) 1993-2001; George W Bush (43rd, Republican) 2001-2009; Barack Obama (44th, Democrat) 2009-2017; Donald J Trump (45th, Republican) 2017-present. Harry Truman assumed the presidency on 12 April 1945 on the death of Franklin D Roosevelt. Truman will undoubtedly be remembered as the first head of state to authorize the use of atomic weapons, with the bombing of Hiroshima and Nagasaki in early August 1945. The Cold War began under his presidency. He was responsible for the Berlin Airlift in 1948, but also saw the start of the Korean War. He famously won re-election in 1948, defeating Thomas Dewey; even newspapers had gone to press declaring Dewey as the winner. Truman was succeeded by General Dwight Eisenhower who had been Supreme Commander of Allied Forces in Europe during the Second World War. Eisenhower served two terms. This was the era of the Cold War. And one consequence of that was the 1960 U-2 spyplane incident during his last year in office. The US Interstate Highway System was inaugurated during his presidency. The presidency of John F Kennedy was all too short. It had promised so much more, but an assassin’s bullet robbed the nation of that promise in November 1963. I remember vividly the moment that programs were suspended on TV in the UK to announce his death. And what grief there was, not just in the USA, but globally. In May 1961, Kennedy announced a plan to land a man on the moon and bring him safely back to Earth before the end of the decade. He did not live to see that dream realized eight years later. In August 1961, the East Germans under Soviet encouragement began to build the Berlin Wall, that was to remain in place for the next 28 years. Kennedy visited Berlin in June 1963, making his famous Ich bin ein Berliner speech. Perhaps Kennedy will be remembered for his handling of the Cuban Missile Crisis in October 1962. It was a period of heightened tension that we also felt in the UK. I clearly remember waiting in class on that fateful day, wondering if Armageddon was about to happen. Soviet leader Nikita Khrushchev backed down. Crisis averted. Who knows what Kennedy would have achieved, despite his prolific womanizing, had his life not been cut short. Vice President Lyndon Johnson was sworn in as the 36th POTUS on Kennedy’s death. He served out the rest of Kennedy’s term, and won one for himself in 1964, but did not seek re-election to a second term as he was entitled to do in 1968. Johnson has two legacies. Let me state the positive one first: his enactment of Civil Rights Act in 1964, and other progressive legislation. But he was also responsible for the escalation of the Vietnam War, that damaged his credibility with the electorate. Democrats lost the White House in the election of 1968, that brought Richard Milhous Nixon to power. And how he abused that power. Nixon is synonymous with Watergate, impeachment proceedings, and resignation. Yet, Nixon had two significant achievements: rapprochement with China in 1972, and détente with the Soviet Union leading to the signing of the Anti-Ballistic Missile Treaty. Nixon had already lost his Vice President Spiro Agnew to scandal before he himself was forced from office. Several months later, House Minority Leader Gerald Ford was appointed Vice President, and assumed the presidency on Nixon’s resignation in August 1974. He was the first person to have held both the Vice Presidency and Presidency without being elected to office. Perhaps Ford will be best remembered for his September 1974 full and unconditional pardon for any crimes [Nixon] might have committed against the United States while president. Ford lost the 1976 election to Georgia governor and outsider Jimmy Carter. Carter served only one term. His denouement was the Iran hostage crisis that lasted from November 1979 to January 1981. He was perceived as a weak leader, the rescue of the hostages in Tehran having failed. The crisis ultimately led to Carter losing the 1980 election to Ronald Reagan. Minutes after Reagan was sworn into office the hostages were released by Iran. Since leaving the presidency in 1981, Carter and his wife Rosalind have shown themselves to be exemplary citizens through their work to wage peace, fight disease and build hope. Carter was awarded the Nobel Peace Prize in 2002. Ronald Reagan survived an assassination attempt in March 1981, just a few weeks after his inauguration as the 40th POTUS. A former governor of California, Reagan took the Republican Party to a more conservative side of politics. While he will be remembered for his escalation of the Cold War (his ‘Star Wars’ initiative) after a period of better relations with the Soviet Union under Jimmy Carter, Reagan nevertheless attended the Reyjavik summit with Soviet President Mikhail Gorbachev that led to the end of the Cold War and the signing of the Intermediate-Range Nuclear Forces Treaty in 1987. Reagan was re-elected in 1984, defeating Jimmy Carter’s Vice President, Minnesotan Walter Mondale. George HW Bush was elected as 41st POTUS, and served just one term. He was defeated by Arkansan Bill Clinton in the 1992 campaign. Bush was a Second World War fighter ace in the US Navy, and one of the youngest to serve in that capacity. The most significant event of Bush’s presidency was the Gulf War, that pushed Saddam Hussein back from his occupation of Kuwait, but left much unfinished business that would be completed by his son George W Bush who was elected as the 43rd president in 2000. Bill Clinton will undoubtedly be remembered for just one thing: the Monica Lewinsky scandal that almost led to his impeachment. Clinton, in my opinion, was one of the most gifted speakers I have ever heard. Without notes or teleprompters he could hold an audience spellbound as he embraced a wide range of topics in his speeches. The economy boomed under his presidency, and he left office with one of the highest approval ratings ever. George W Bush came to the presidency somewhat controversially. It was all about hanging chads and the recount in Florida that eventually handed the election to Bush. Later in 2001 he was faced with the aftermath of the September 2001 attacks on the World Trade Center in New York and the Pentagon in Washington, DC, that then led on to the invasions of Afghanistan and Irag, that I alluded to earlier. With the election of Democrat Barack Obama in 2008, as the 44th POTUS, the presidency entered an eight year period of relative calm, but above all decency. Obama is a charismatic orator, but perhaps his presidency did not achieve as much as was hoped for or expected. His signature achievement was the Patient Protection and Affordable Care Act (Obamacare) that was signed into law in March 2010. It must have been significant because ever since No 45 assumed the presidency he and Senate Republicans have been doing their darndest to repeal the Act. The same can be said for other legislation and initiatives that Obama sponsored. Donald Trump seems hell bent on eradicating any aspect of Obama’s legacy. And, at last, that brings me on to Donald J Trump, No 45, elected to the presidency with around 3 million fewer votes in the popular vote than his Democrat rival, Hillary Clinton, but squeaked in through winning the Electoral College 304 to 227. What can I say about Donald Trump that has not been said more eloquently elsewhere? He is perhaps the most odious and inept (and allegedly corrupt) individual elected to the presidency. However, whatever happens over the next 18 months before the 2020 election, and whether Trump is re-elected, he has already secured a legacy. How? He has achieved something, twice, that all presidents aspire to but rarely do. Two of his nominees were appointed Justices on the Supreme Court, thereby ensuring a conservative bias on the bench, and Trump influencing a conservative political agenda for decades to come. He may even yet have a third nominee appointed. It depends if and when octogenarian Justice Ruth Bader Ginsburg succumbs to ill health (or worse) and a replacement has to be found. But how would I sum up his presidency to date? There is but one word: NARCISSISM. The presidency, what he says, what he does, how he interacts with others all comes down to just one thing: himself. It affects his whole outlook on the world, his embrace of ‘fake news’, his weak relationship with the truth, his attacks on friends and foes alike. Never have we seen the like in the White House. Donald Trump makes even Richard Nixon look presidential. And that’s saying something. * All images of Prime Ministers and US Presidents from Wikipedia. I’ve just discovered (via Twitter) that 19 March was Taxonomist Appreciation Day. This was, as far as I can make out, a celebration of the important—fundamental even—contribution that biologists known as taxonomists make to our understanding of the living world. Taxonomists bring order to the biodiversity that’s all around us. Indeed, without this order and understanding, it would be more difficult to know for example which plants and animals are endangered, and to prioritize what to conserve, and where. The most celebrated taxonomist of all was surely the eighteenth century Swedish botanist Carl von Linné (whose Latinized name, Linnaeus, identifies him as the taxonomic authority, L., for many plants and animals). So what do taxonomists do? One of their important roles is to describe and catalogue all plants and animals and, in the case of plants, publish this information in compendia known as Floras as an aid to identification, like those written about the plants of the British Isles and Europe that have been studied for hundreds of years. Other Floras are still being written. Take the Flora Zambesiaca, for example, a project started in 1960 as the taxonomic study of native and naturalised plants of the Zambezi River basin, covering the territories of Botswana, Malawi, Mozambique, Zambia, Zimbabwe and the Caprivi Strip. This is a work in progress, and there are many other parts of the world where the diversity of plants is only now being discovered and documented, particularly in the Tropics. But taxonomists also look at the variation within species, and assess the dynamics of species distribution and evolution. I had my first taste of taxonomy at the University of Southampton where, as first year students or freshmen in 1967/68, we studied the diversity of flowering plants under the tuition of taxonomist Les Watson. He and another colleague Alan Myers took us to the west coast of Ireland for a field course in July 1968 where we studied the vegetation of the Burren in Co Clare. In my final or senior year in 1970, I sat in on a plant taxonomy course given by eminent taxonomist Professor Vernon Heywood from the University of Reading (Les Watson had moved to Australia in 1968/69, and had not been replaced in the Department of Botany). I met up with Professor Heywood in 1991 at a conference in Rome where we had an opportunity to reminisce about that course. I never expected that, one day, I would engage in taxonomic research. However, I never participated in describing or naming plant species, nor undertaking the enormous task of contributing to Floras that is sometimes considered the be-all and end-all of taxonomists’ work. I take my hat off to those taxonomists who write Floras, often relying on dried herbarium specimens of plants collected in nature. Nevertheless, in my own work, I have used herbaria on occasion, and twice spent time looking at specimens of lentil (Lens culinaris Medik.) and grasspea (Lathyrus sativus L.) among the millions of herbarium sheets curated in the Herbarium at the Royal Botanic Gardens at Kew. My interest was in the relationships of these cultivated plants and their wild relatives. Comparing notes in the field in the Andes of central Peru with potato taxonomist Professor Jack Hawkes (who supervised my PhD dissertation). In 1973 I joined the International Potato Center in Peru as an Associate Taxonomist, studying the evolution of cultivated potatoes. Biosystematics, a sub-discipline of plant taxonomy, was my field, and I investigated species relationships through field experiments to understand patterns of morphological variation, through breeding experiments, and cytogenetic analysis of chromosome pairing in hybrids, among other several different approaches. When I returned to Birmingham in 1981 as Lecturer in Plant Biology, I continued research on wild potatoes, and also several legume species. I also contributed about half the lectures to a second year module on flowering plant taxonomy. On moving to the International Rice Research Institute (IRRI) in the Philippines in July 1991, my colleagues and I delved into the taxonomy and species relationships of the two cultivated species of rice, Oryza sativa L. and O. glaberrima Steud., and the 20 or so wild species in the genus Oryza. 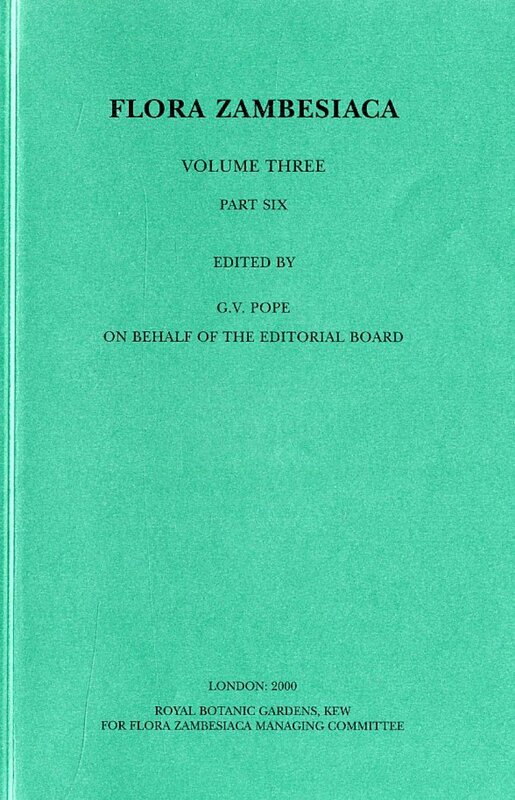 We published quite extensively, and you you can peruse a list of rice publications (many with PDF files) here. Just last week I met up for lunch with six retired former colleagues from the School of Biological Sciences at the University of Birmingham: three plant scientists (including me), three geneticists, and a zoologist. Inevitably we began to discuss not only the administrative and organization changes that had occurred at the university (I taught there between 1981 and 1991), but how the teaching of biology had also changed, and the topics that now form a core biology curriculum. Back in the day, whole organism biology still formed an important component of an undergraduate degree in biological sciences at Birmingham. Nowadays, and for obvious reasons, there’s much more focus on molecular biology, and recent hirings in what is now the School of Biosciences (Biological Sciences and Biochemistry merged some years back) reflect that change of emphasis. Alas, it’s no longer possible to study at Birmingham for a biology degree with a plant sciences focus. But that’s not just a Birmingham issue; it’s nationwide. And taxonomy is perhaps the discipline that has suffered more than most. Taxonomists are just not coming through the system. Just at the time when one can argue there should be more demand for taxonomists than ever before, given the environmental changes that threaten the world’s vegetation. In some regions we may be losing species even before they have been identified. Harvard biologist EO Wilson wrote this in 2017: Our incomplete taxonomic knowledge impedes our attempts to protect biodiversity. A renaissance in the classification of species and their interactions is needed to guide conservation prioritization . Now, I started this piece stating that everyone is a taxonomist. Is that a fair assumption?I think so. 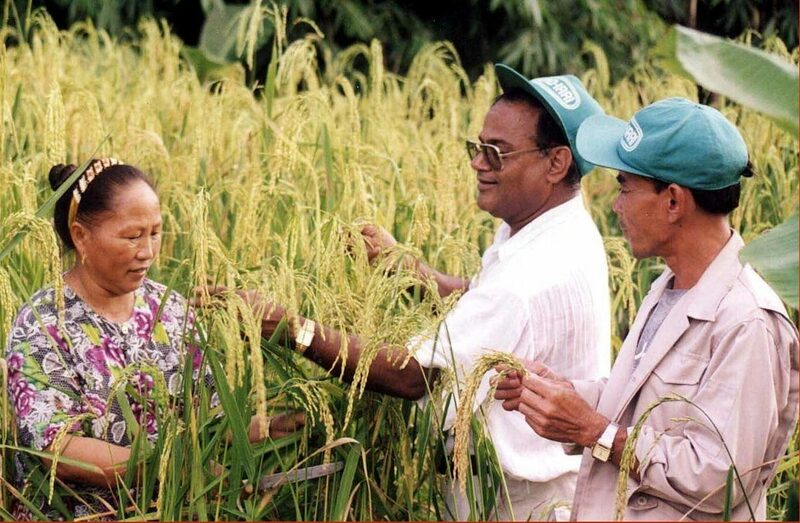 Appa Rao collecting upland rice varieties from a farmer in the Lao PDR. Taxonomy (and classification) is a fundamental human characteristic, something we do every day. We sort the complex world around us into meaningful categories, and we give them names. In many societies, farmers and their husbands use so-called ‘folk taxonomies’ to manage the various crops grown, and often the diversity of different varieties within a crop. I have myself talked to potato farmers in the Andes of southern Peru about their cultivation of different varieties, and why these are grown in different ways. In the Lao PDR, with my colleague Dr Appa Rao, we looked at how farmers name all their rice varieties. Even before talking to my second year students about flowering plant taxonomy as such (and the different approaches used to study variation), I asked them to practice some simple taxonomies on themselves: males vs. females, blondes vs. brunettes, spectacle users vs. non-users, for example. These are discrete characteristics, binary, one or the other. Then we’d look at the complexity of coping with characters that vary quantitatively, such as height, length, etc. Fortunately, there are many numerical techniques that allow us to cope with all sorts of measurements, and reduce complexity to a state that can be interpreted more easily. The classification of different rice species based on the measurement and analysis of a range of morphological characters. The use of different molecular markers now allows us to refine taxonomies built using morphological data. But, as I once read in a letter published in a scientific journal, a professor of taxonomy decried the lack of basic species knowledge among many students using molecular approaches. They could wax lyrical, he stated, about the value of different molecular techniques, but they had hardly looked at a living plant. That brings me back to my concern about the reduction in teaching whole organism biology. As I say, we are all taxonomists, one way or another. Unfortunately I don’t see any scientific expansion (in the UK at least) in this particular discipline. The situation may be different in North America. Plant sciences are still very strong in many US universities, and indeed there is a bill before Congress that promotes botanical research & sciences capacity, generates demand for native plant materials, & authorizes related federal activities. I’ve just finished reading the novel Anna of the Five Towns by Arnold Bennett, set during the late 19th century, in the Potteries of North Staffordshire. And now I have started his 1908 novel (considered his finest), The Old Wives’ Tale, that is set in the 1860s and beyond, also in the ‘five towns’. Bennett used the local Potteries dialect sparingly throughout his novels. I came across a new dialect word while reading The Old Wives’ Tale this morning, which has perhaps taken on a new meaning nowadays: He admitted a certain feebleness (‘wankiness‘, he playfully called it, being proud of his skill in the dialect) . . . And this use of dialect came to my mind in light of something I read about recently (more of which at the end of this piece). One author who did successfully write in Potteries dialect was William Bloor. His work has been archived at Keele University, and is available online where there’s this interesting comment: On the written page the dialect has the appearance of an arcane language, with mangled vowel sounds and harsh consonants rendering it incomprehensible to many. You can find a list of Potteries dialect words here. Better still, listen to local Potteries author Alan Povey tell one of his Owd Grandad Piggott stories in dialect. Can you understand? I can (mostly). Potteries dialect is much less known (and appreciated, perhaps) than Cockney (London), Brummie (Birmingham), Scouse (Liverpool), or Geordie (Newcastle upon Tyne). Today, there are probably few people in North Staffordshire who still fully speak in dialect as many did up to the 1950s. The influence of radio and television has surely brought about a standardization in the way we speak. But what are the Potteries? They are the six (not five) towns, north to south, that comprise the City of Stoke-on-Trent: Tunstall [Turnhill], Burslem [Bursley], Hanley [Hanbridge], Stoke [Knype], Fenton, and Longton [Longshaw], and so named because they became a center of ceramic production in the early 17th century, due to the local availability of clay, salt, lead and coal. I grew up in North Staffordshire, in the small market town of Leek (Axe in the Bennett novels), on the edge of the Staffordshire moorlands, just 10 miles to the northeast of the Potteries. Between September 1960 and June 1967 I traveled the fourteen miles every day from home to school in Trent Vale on the south side of Stoke. In Leek and the Potteries I did hear people talking in the local dialect, but rarely at school. Boys of my age had moved on linguistically, so to speak. But while I don’t speak dialect, I do use a few dialect words such as nesh (sensitive to the cold) or mithered (bothered). Growing up, I often heard the term of endearment, duck (used for men and women), but never used it myself. I guess my accent and pronunciation (like anyone else) is a consequence of what I heard at home growing up. And has been modified by years of travel and living overseas. My mother was born in London’s East End, but grew up in Epsom, Surrey. She emigrated as a young woman to Canada and the USA in the 1920s. My father was a Staffordshire man, from Burton-on-Trent, but he moved away as a young man to the Cotswolds and then to sea, traveling the world as ship’s photographer. The way they spoke must have influenced me. For example, I pronounce schedule in the American way: skedule, not the soft shedule. That came from my mum, because that’s how I heard her pronounce it, something she probably picked up while in Canada and the USA. A week ago or so, a rather interesting ‘quiz’ about British-Irish dialects appeared on Facebook (originally from The New York Times), and was widely shared. It wasn’t your run of the mill Facebook quiz. It seemed to have a purpose. Several people I know took the quiz, including my eldest brother and his wife. I took the quiz. We were all amazed at the accuracy of pinpointing where we came from,based on words we use in everyday speech. This is what my brother posted afterwards: Regarding myself – it says that I formed my language/speech style as being SW Derbyshire and SE Cheshire, which is ‘Spot-on’, Pauline’s was correct also being Perthshire and Aberdeenshire. I guess the algorithm behind the quiz used certain ‘signature’ words from different parts of the country (like nesh in my case) and gave them extra weight. My result pointed towards Stoke-on-Trent northeastwards past Leek into southern Yorkshire, but with a greater probability in North Staffordshire. Also spot on! Just click on the link below and try for yourself.